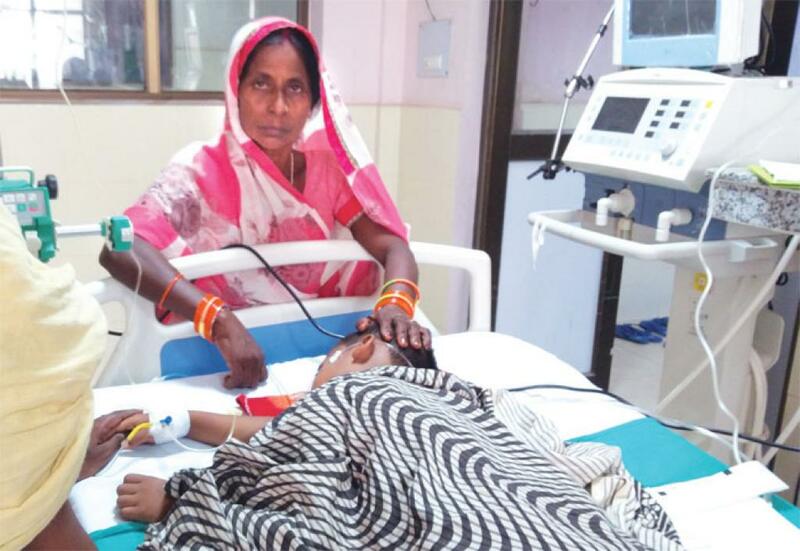 In yet another proof of mismanagement in government hospitals, shortage of oxygen has claimed 49 lives over a month in the special newborn care unit of Ram Manohar Lohiya hospital in Uttar Pradesh’s Farrukhabad district. In August, 62 infants died in Gorakhpur’s state-run BRD hospital, allegedly due to the same reason—the lack of oxygen supply. The incident came into light after district magistrate of Farrukhabad Ravindra Kumar ordered a probe into this matter following his visit to the hospital and interactions with parents, reported CNN News 18. Initial investigation report cites the deaths to shortage of oxygen and lack of medical services. An FIR has been filed against the CMO, CMS and some doctors under Sections 176, 188 and 304 of the Indian Penal Code. The Uttar Pradesh government, however, denied that the deaths took place owing to lack of oxygen supply but attributed them to various causes, as per the Indian Express. The government has said that 19 of the 49 children were stillborn and others died of various causes including perinatal asphyxia, a medical condition resulting from deprivation of oxygen to a newborn infant. A technical team headed by the director-general, health, would visit Farrukhabad on September 5 to probe into the deaths and submit a report. Opposition parties have lashed out at the government after an alleged second case of mismanagement this month. In Gorakhpur, close to 70 children have allegedly died in August due to the lack of oxygen supply. An analysis by Down To Earth shows that negligence is rampant across government-run hospitals in India, with hundreds of such deaths reported across the country. More than 9,950 children have died of encephalitis in a single hospital in Gorakhpur in the past 40 years. But the health system continues to be unprepared to deal with the disease. On August 10 this year, a news portal ran a story about shortage of liquid oxygen in the Baba Raghav Das Medical College (BRD), and warned of an impending crisis. Since January, the disease had already claimed 160 lives. But oxygen was not made available and that night 23 children died. Children continued to die, and by August 21, the death toll rose to 260 for the year. Though it was clear that the children died due to lack of oxygen in brd on August 10-11, the state government denied underpreparedness, even as it suspended the principal of the college and vowed to take action against the supplier. So was the hospital management aware about the shortage? The journalist who wrote the story, Manoj Kumar Singh, says everyone was aware about the looming crisis and the government is now just passing the buck. It seems Rajiv Mishra, the principal of brd, reminded the authorities in several letters about sanctioning the pending payment to the supplier. According to media reports, Mishra wrote the first letter on March 22 to senior officials in the state’s health ministry. On August 1, Mishra copied this letter to the Medical Education Minister Ashutosh Tandon. Reports also suggest that the supplier too had informed the college and higher authorities that unless his dues of R68.65 lakh were cleared, the company would stop delivery. This is not the only case of mismanagement in government hospitals across the country as far as shortage of oxygen supply is concerned. 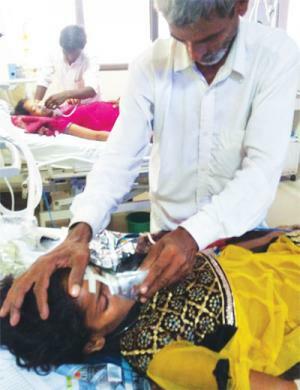 According to Amulya Nidhi, an Indore-based activist, in July, 17 people, including two children, died at the Maharaja Yeshwantrao Hospital in Indore due to lack of oxygen supply. The Madhya Pradesh government has constituted a “committee” to investigate the matter (see ‘In cold blood’). K P Kushwaha, who was the former head of the paediatrics department at the brd Medical College, says corruption is the biggest reason for these deaths. From sanctioning to transferring money, a share of the money has to be given to government authorities, he says. Amit Sengupta, a Delhi-based public health expert, says it is evident that the Uttar Pradesh government did not sanction the payment despite rep-eated reminders. It is likely that this was a result of corrupt practices, and thus, needs to be investigated. The Gorakhpur tragedy is an example of the deplorable state of India’s public health system. BRD caters to patients from 15 districts of eastern Uttar Pradesh and also from a few districts in Bihar. Patients from Nepal too come here for treatment. At any given point in time, the paediatric department is treating 300 children, but there are only 210 beds. So the hospital is not only overcrowded, but it also faces a resource and financial crunch. A Comptroller and Auditor General report in June this year had warned that there was a 27.21 per cent shortage of clinical equipment and 56.33 per cent shortage of non-clinical equipment in this hospital. The supply of oxygen is part of non-clinical equipments. Srinath Reddy, president, Public Health Foundation of India, a policy think tank, says that to ensure accountability, India needs to enforce standard management guidelines for doctors, nurses and hospital staff for effective treatment methods as well as to procure equipments. Yet most states have not even adopted the Clinical Establishment Act, 2010, which prescribes a minimum standard of services and facilities for clinical establishments, he says. Experts say there is a need to decentralise the public health management system to ensure accountability. At present, the inefficiency is partly due to the lengthy bureaucratic processes. Reddy says to ensure accountability, the Right to Health is essential. India’s National Health Policy, 2017, however, says that the country cannot yet include this in the Constitution. Sengupta says that in many countries such as Brazil and South Africa, the Right to Health is part of their Constitutions, which means that the government can be held responsible in cases of laxity and negligence. Worse, loopholes in India’s healthcare system allow the accused to easily evade the law, adds Sengupta. Acute Encephalitis Syndrome (aes) has been hounding children in Uttar Pradesh’s Gorakhpur region for many decades. Most cases and deaths are reported in August and September each year. The lack of oxygen in brd hospital may have made the headlines this August, but the fact remains that the scientific establishment in India is yet to decipher the cause of these deaths. A review of research to identify the cause of the disease says that most studies between 1975 and 1999 identified Japanese Encephalitis Virus (JEV) as the main cause of encephalitis across the country. However, studies published after 2000 point to a shift to Chandipura virus and entero-viruses, says the study published in the National Medical Journal of India in 2012. So the mystery of encephalitis remains unresolved. In fact, researchers say the cause of the disease in as many as 59 per cent of patients between 2013 and 2014 in Gorakhpur remains unknown. Apart from JEV, Chandipura virus and enteroviruses, aes patients have also been tested for herpes simplex, measles, mumps, dengue, varicella, Parvovirus, West Nile virus, malaria, typhoid, Bagaza virus, Coxsac-kie virus, leptospirosis, heat stroke, Reye’s syndrome and plant toxins like those in litchi fruits and pods of Cassia occidentalis. This year, the mystery deepened when researchers came up with another causal agent. It was linked to Orientia tsutsuga-mushi, a bacterium which causes a disease known as scrub typhus. The disease was on the decline in Asia for many decades, but now it seems to have re-emerged. “Gorakhpur and Assam have reported the maximum number of scrub typhus cases leading to aes in the country,” says Siraj A Khan of the Regional Medical Research Centre, Northeast Region, Indian Council of Medical Research (icmr), Dibrugarh, Assam. The most common symptoms of scrub typhus include fever, headache, body ache, and sometimes rashes. Recent studies suggest that it can cause aes too. When 46 children admitted to brd between August 17 and October 16, 2016 were tested for scrub typhus, immuno-globulin M—the first antibody to appear in response to an antigen—was detected in 63 per cent of cases. Similarly, immuno-globulin G—which is the most common type of antibody in blood—was found in 82.6 per cent of cases. This indicates that these children were suffering from this disease. This study was published in Emerging Infectious Diseases in August this year. 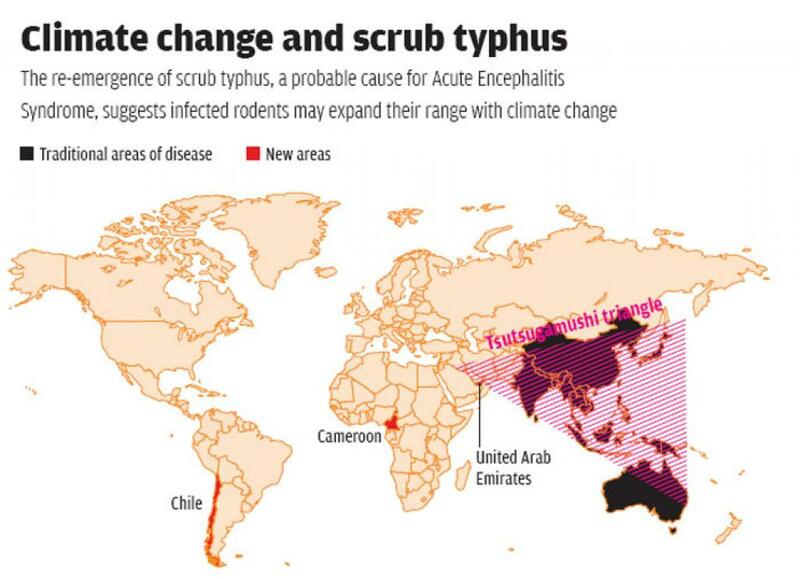 Apart from India, scrub typhus cases have been also re-emerged in South Korea, China, Micronesia and Maldives. The disease has now spread to new countries such as Cameroon, United Arab Emirates and Chile. Scrub typhus is present in areas with scrub vegetation which grows where mature forests have been cut down. Rodents and humans are incidental hosts to the mite, which is both a reservoir and the vector for the bacteria. Its re-emergence and spread to newer areas sug-gest that rodents bearing infected mites may be expanding their range due to climate change, argues David M Walker in an article published in the New England Journal of Medicine in September 2016. Walker is the director of the Center for Biodefense and Emerging Infectious Diseases, the University of Texas Medical Branch. A September 2012 study published in Ecological Applications shows that the pressures of global trade too increases the risk of disease incidence due to changing land use. For example, after Taiwan joined the World Trade Organization in 2001, rice cultivation fell from 80 to 55 per cent. This led to an exponential increase in the number of ticks and chiggers in abandoned rice fields. Flooded paddies are poor habitats for the mites. The authors say that this study shows that apart from climate change, global travel and habitat destruction; economic policies can also affect human health by influencing and changing the landscape. However, some experts are not con-vinced that all the cases in Gorakhpur were due to the scrub typhus. “It seems to be a mix of illnesses and the major cause of the outbreak still remains elusive,” says George M Varghese, professor, Department of Infectious Diseases, Christian Medical College, Vellore, Tamil Nadu. The symptoms reported from Gorakhpur are atypical to scrub typhus. Most of the patients were infants, but they are unlikely to have any exposure to vegetation, which is the mode of acquisition of scrub typhus, he adds. The uncertainty in the causal organism is one of the reasons for the high number of deaths. In Assam, which is recognised as an endemic zone for aes caused by the JE virus, scrub typhus is usually not suspected. Though scrub typhus is treatable, death rates are as high as 49 per cent, says a study published in Emerging Infectious Diseases in January 2017. The re-emergence may also be due to changes in the antibiotics used to treat fevers. Earlier, fever patients would be ro-utinely prescribed antibiotics such as tetra-cycline and chloramphenicol, which effec-tively treat scrub typhus. But now the commonly-used antibiotics are cephalos-porins, which are ineffective against this disease, says Varghese. Nevertheless, it is clear that scrub typhus is back. Earlier, community samples in India showed around 5 per cent serological prevalence of past infections, but now the prevalence rates are as high as 30 per cent, says Varghese. The world is facing a re-emergence of scrub typhus and it is crucial that doctors are made aware to ensure early diagnosis and proper treatment, says Varghese. In 2015, ICMR developed guidelines for diagnosis and management of such diseases. Early diagnosis and prescribing the drug, doxycycline, which costs less than R200, can easily save a patient. India is also part of an ongoing trial in high burden countries to evaluate the best treatment for severe scrub typhus,” reveals Varghese. While researchers like Varghese are working to improve and develop treatment and diagnostics, the need of the hour is to quickly solve the mystery around the disease to help patients. Walker points out that researchers seldom work on rickettsial diseases, which includes scrub typhus due to difficulties in carrying out research, even though it is often as prevalent as malaria and dengue. “This neglect has led to spotty and incom-plete data that preclude the calculation of disability-adjusted life-years lost to the disease—information that is essential for soliciting philanthropic support for re-search,” he writes. The article was first published on Sep 1-15 issue of Dwon To Earth magazine under the headline "Suffocating Tragedy"
More than 60 children have died at the BRD Hospital, Gorakhpur. The tragedy first came in news on August 10. The initial reason reported was shortage of oxygen in the hospital. It seems that the hospital administration had failed to pay the bills on time and after repeated warnings, the supplier stopped the oxygen supply. Since then, the hospital has been visited by the top health officials. The hospital administration maintains that they managed to get oxygen from alternate sources. However, the principal of the college and hospital has been suspended. The state officials also say that these children had died of natural causes. BRD Hospital is well known and most probably the only functioning government hospital in the area and children come here when all other treatment has failed. The death of so many children is a norm, they say. People die in hospital needlessly across the country. 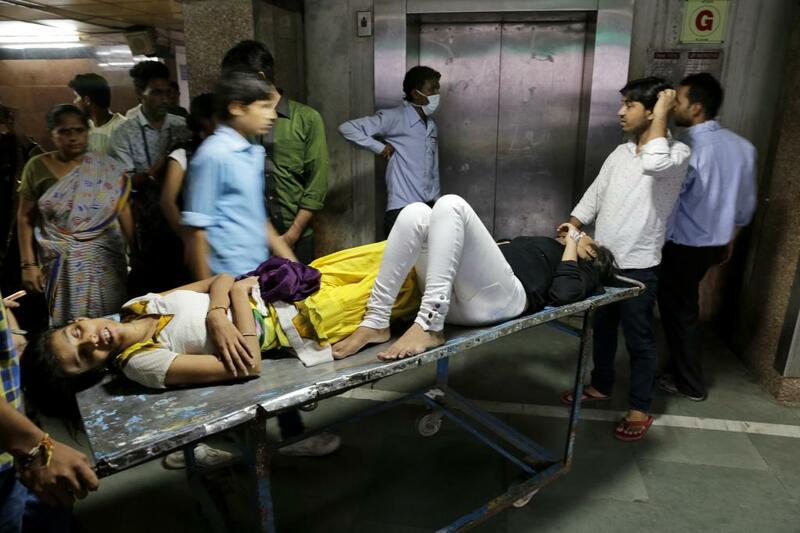 In June, 17 people, including two children, died in the Maharaja Yeshwantrao Hospital in Indore due to alleged cut in the oxygen supply of the hospital. In May, 20 patients died at Bihar’s largest government-run hospital (Patna Medical College and Hospital) allegedly due to lack of medical attention. This happened during a state-wide boycott by junior doctors in Bihar. Children are often the worst victims in hospitals. In October 2016, children died because the community health centres in Malkangiri district hospital did not have machines for CT scans or MRI scans, or even a ventilator. In May, 2016, seven children died at a government hospital in Rajasthan's Ajmer. The families alleged negligence by doctors. 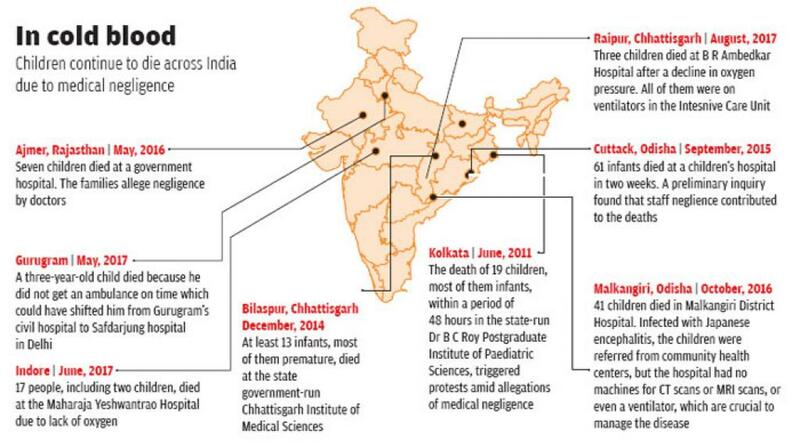 In December 2014, some 13 infants, most of them reportedly born premature, died at the state-run Chhattisgarh Institute of Medical Sciences (CIMS) in Bilaspur district in one week. Their families too alleged mismanagement and medical negligence. The case of BRD Hospital is more worrying. A Comptroller and Auditor General (CAG) report in June had pointed out that the hospital lacked basic infrastructure. For example, there was 27.21 per cent shortage of clinical equipment and 56.33 per cent of non-clinical equipment. The supply of oxygen is part of the non-clinical equipment. It seems that BRD hospital parked their funds (Rs 27.38 crore) in Lucknow. “The parking of funds not only violated the financial rules but also deprived patients of adequate healthcare as essential equipment could not be procured on time…,” the report said. This is not the first case where children have died needlessly. What we need to ensure is that this is the last time. What needs to be seen here is that BRD hospital is the only place providing services to the poor in the state. The facilities here are so threadbare that it takes little to trigger a slew of tragedies. Nobody wants their child to die and if better care was available at private hospital at affordable price, they would have taken the child there. This is yet another instance that calls for strengthening of public health system in the country. For last decade or so, there has been an unfortunate push towards privatisation of health care services. Now public health centres are also being given away to the private sector. This is only going to take away the last option available to the poor. Public health care in India is already under a lot of stress. The Rajasthan government recently decided to hand over 213 primary health centres in the state to private agencies. These would then be run as a public-private partnership. In May, non-profit Jan Swasthya Abhiyan filed a petition in the Rajasthan High Court demanding the withdrawal of the scheme. The government had tried to do this earlier in 2015 too. In 2015, the centre had opposed the move towards privatisation suggesting that this could only be a stop gap solution. However, in July, NITI Ayog suggested that private players be allowed to treat non-communicable diseases in public hospitals. This move has faced a lot of flak from public health activists who feel that this will lead to an overall capture of public health facilities by private providers. But recent examples show that even private players are no better in providing healthcare. In April 2017, Kolkata-based Apollo Gleneagles Hospital is facing charges of medical negligence after a four-month-old baby girl died there in April this year. The family alleges that she lost her life due to denial of timely treatment. It would be better if the government strengthens the public health system such that it provides the minimum healthcare to the poor in the country. Oxygen surely comes under the basic minimum of health care. The government is in a tizzy trying to minimise the harm to its reputation. The Union Minister of Health has approved the setting up of a regional medical centre in Gorakhpur to study children's diseases. The Centre has asked the state government to file a report on these deaths. Hopefully, it would keep in mind that while it is a good option for long-term benefits, public health care services have to be provided to the poor immediately. The children will not be able to hold their breath till the results of the study are available. Mystery behind Gorakhpur encephalitis deaths: is scrub typhus the likely cause?